Who Was the Original Bluebeard? Chris Hemsworth in 'Snow White and the Huntsman'? Of the blue room in the centre. Each wife was flat—without head! How came the stain on this one? Nor brothers’ aid to cheer them. And shaved his beard and head off. Found in Bluebeard Tales From Around the World . Another example of Bluebeard's popularity is The History of Bluebeard’s Six Wives, a novella by Sabilla Novello first published in 1875. The wives "whom hitherto we have known only in a decapitated condition" are presented individually and are all rather silly. This book was intended for readers young and old after all! Its success was sufficient to garner two sequels, Bluebeard's Widow and Her Sister Anne: Their History Evolved from Mendacious Chronicles (1876) and Hoho and Haha: Their Adventures‎ (1877). The latter was an account of Anne’s children. The first is included in Bluebeard Tales From Around the World , but I wasn't able to obtain a usable copy of the second one so I didn't include it nor the third. The last one is about Hoho and Haha, the children of Sister Anne. Yes, that story has been written! PRINCE HOHO and Princess Haha were son and daughter to King Adelbren, as those know who have read the history of "Bluebeard's Widow and her Sister Anne," and of how the latter came to be Queen. The real names of these children were Adeptino and Zeffiretta, but from their birth they had been known as Hoho! and Haha!—-the interjections uttered at their appearance into this world by their grandfather, King Dunzone; and under these names shall they be transmitted to posterity through this record of their adventures. For fun, here are sell sheets for the first two books that are quite fun and illustrate how publishing has and hasn't changed in 130 years. The History of Bluebeard's Wives,Collected From Mendacious Chronicles. With Chromograph Illustrations by G. Cruikshanks. Published By Grant & Co., Turnmill Street, E.C. Price 51. "We strongly recommend all our young friends who are not already acquainted with the veritable History of Bluebeard to procure this narrative of his career, collected from the aforesaid mendacious chronicles. Those young readers who know the old story may most profitably study this new version, which relates not a few surprising incidents needed to explain his lordship's career. Some of these were unknown to ourselves; for example, how the beard of Bluebeard became blue. On this point Miss Sabilla Novello's explanation is consistent with probability, and with the character of the wearer of the beard, and far more striking than that other explanation, or attempted explanation, for which we have been indebted to the archaeologists."—Athenaum. "The story of Bluebeard has so often been told, that it is perhaps only fair that the story of his six wives should be set forth with equal minuteness. This labour has been undertaken by Miss Sabilla Novello, and the result is a thin square volume, containing a number of pictures printed in bright colours, with stories devoted to the biography of those unhappy ladies. Neither the artist (Mr. G. Cruikshanks, jun.) nor the authoress of the stories cites any authority for the very circumstantial details which they present to the youthful reader; but in this respect the biographers of Bluebeard himself are not more explicit, and the six wives have at least as good a right to be heard through their counsel as the famous Oriental tyrant himself. "—Daily News. 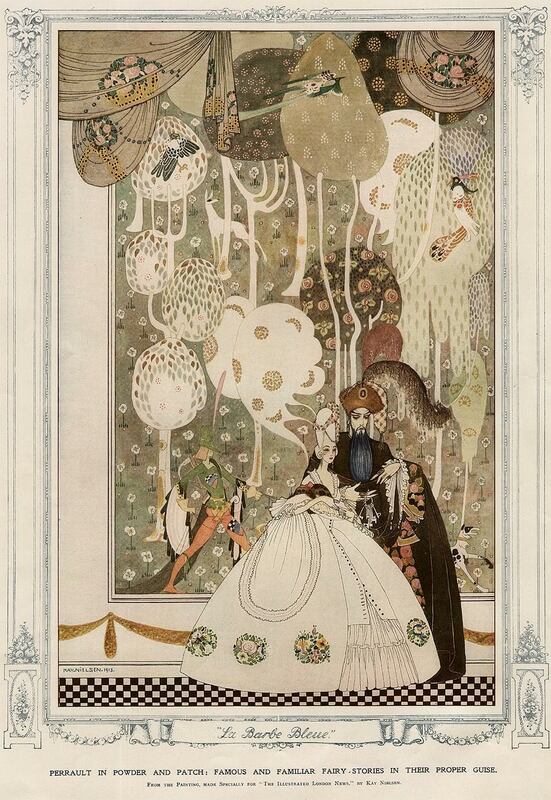 "'The History of Bluebeard's Wives' is a gorgeous volume, illustrated by G. Cruikshanks, Jun. The conception is truly ingenious. Unlike our ordinary Bluebeard chroniclers, who never go further back in their researches than the nuptials of Bluebeard and Fatima, the present author has given us a veracious account of the lives of all Fatima's predecessors, whom hitherto we have known only in a decapitated condition. We can now study their biographies with the help of the most attractive pictures, and are even privileged to make acquaintance with their lord and master before his evil propensities were developed or his beard was blue."—Examiner. "The story accounts for much that has hitherto been obscure in the last wife and only widow; it may be found interesting to those little people who always want to get to the very beginning. "—Saturday Review. Bluebeard's Widow and Her Sister Anne. Published by WARD, LOCK AND TYLER. "Miss Sabilla Novello having written, from mendacious chronicles, the history of Bluebeard's Wives, has here evolved from the same mysterious source a charming little story of the history of Fatima and her Sister Anne—the last of Bluebeard's Wives who, with her Sister, proved too much for that terrible lover The story is pleasantly told, and will be an agreeable addition to this class of very light literature. Miss Sabilla Novello has shown herself as clever with her pencil as she is with her pen, for the whole story is illustrated by pretty drawings in outline of the queer, quaint society to which she introduces us. "—Western Daily Mercury. "This dianty little volume is a sequel to the 'History of Bluebeard's Wives,' by the same authoress, and it gives in half a hundred amusing pages some very astonishing and attractive, baseless and imaginative, 'facts.' The story is told with much fancy, pleasant humour, and grotesque style. The illustrations in broad outline, in sepia colour, are remarkably original and drolly grotesque, and are drawn in excellent artistic style. The little volume will well amuse an idle hour, and is neat enough in outward form to be worthy of a place on any drawing-room table, where its clever sketches would attract attention, and its story be gladly read. "—Birmingham Daily Post. "This is an admirable little work, revelling in the realms of fancy, tastefully and skillfully illustrated by the authoress. Old and young alike may derive an hour's cheerful entertainment by a perusal of the charming little volume, in which is portrayed the lives of Fatima, Bluebeard's Widow, a beautiful but heartless and selfish woman, and Sister Anne, modest, amiable and clever, a bright example of womankind This little book is full of interest, and, being artistically bound, it is an elegant adjunct to the drawing-room table. The Dedication is worth quoting. "—Exeter Flying Past. This one is off topic, but dear to me. With all of the Oprah Show ending hype, I've been reminded of one important thing I share with Oprah (besides being Nashvillians) and that was a favorite teacher. Years ago, I was in school, living at home and returned home to my mother watching Oprah on TV. I was rattling around in the kitchen for a snack when I heard Oprah talking about her favorite teacher, Mary Alice Duncan. I went back into the room and saw that Mrs. Duncan was also my Mrs. Duncan, a special teacher in my life, too. My fourth grade year was a year of transition and change. My family had returned to Nashville after living in Chattanooga for several years. I went from attending an elementary school with one classroom per grade level to a fourth grade school comprised of only fourth grade classrooms that was the same size as my previous elementary school. I was given two team teachers of which Mrs. Duncan was one. Then my homeroom class was dissolved in the face of budget cuts. I was moved to another class away from Mrs. Duncan, more trauma since my new teacher had a subtle harsh streak to her, not horrible, but one I keyed into and never trusted although usually I was her "teacher's pet" grading papers and such. The biggest problem was that I was a precocious reader and had already tested out of all reading levels. I was used to being held back and didn't mind since I didn't know any different. But Mrs. Duncan--and I was young so I don't know all the reasoning--volunteered to have me return to her classroom each day for a special reading class all my own although I was no longer assigned to her team of teachers. And that's what I did for a year. I had my own reading class until another boy moved in halfway through the year and needed it and then we shared our advanced reading class. It was my favorite part of the day and I finally felt like I was working at a real level of education. I also needed that intimacy of a one-on-one class after moving into such a big school, so it was a blessing on many levels. I still wonder where the time came from since that is definitely not "wise" classroom time management with overfilled classrooms. My feeling was always that it happened because Mrs. Duncan made it so. Mrs. Duncan was a special teacher and I've never forgotten her. There were a few other important teachers and librarians that followed, but she was the first to make me feel like I mattered, that my skills mattered and should be nurtured. I was blessed with parents who did that all along, but to have a teacher reinforce the message was a boon. So kudos and thanks to all the great teachers out there who make a difference. The end of another school year is nigh and I hope you enjoy your summers! You can see that original clip on the Oprah site. Apparently Mrs. Duncan was on the show again this week, but I missed it. I will seek it out since the magic of the internet means it will probably show up somewhere soon. In places where a ballad has once been known, the story will often be remembered after the verses have been wholly or partly forgotten, and the ballad will be resolved into a prose tale, retaining, perhaps, some scraps of verse, and not infrequently taking up new matter, or blending with other traditions. Naturally enough, a ballad and an equivalent tale sometimes exist side by side. Child offers examples of this phenomenon by referencing several works including that of Anton Birlinger whose three Bluebeard related tales have been newly translated for this collection. Despite whichever theory dominates, the ballads bear some comparison to the Bluebeard tales and so representative examples are provided here for just such an exercise. Unfortunately, the examples are from the United Kingdom and North America since the oldest known versions, especially the Dutch “Ballad of Heer Halewijn,” are not readily available in English translation. However, a prose version of the tale from Belgium is given as “Wine-Crust, the Blue-Beard of Flanders” in this collection. To learn more about the ballad group, I highly recommend Holger Olof Nygard’s book, The Ballad of Heer Halewijn (1958). “May Colven, where have you been? And there he would marry me. Where they stood thirty and three. Three hours before it was day. And thou the seventh shalt be. To rot in the salt sea. And tumbled him into the stream. Ardiane and Barbe Bleue or, The Useless Deliverance by Maurice Maeterlinck is the last of six plays offered in Bluebeard Tales From Around the World . The heroine's name varies from Ariane to Ariadne to Anne to Adriane which was used in the translation from the French by Bernard Miall that appears in the book. The play is very different from anything else in the collection and thus fascinated me as I read and reread it during editing. The play was adapted into the opera Ariane et Barbe-bleue (Ariadne and Bluebeard) by Paul Dukas. Maurice Maeterlinck (1862-1949), born in Ghent, Belgium, came from a well-to-do family. He was educated at a Jesuit college and read law, but a short practice as a lawyer in his home town convinced him that he was unfit for the profession. He was drawn toward literature during a stay in Paris, where he associated with a number of men of letters, in particular Villiers de l'Isle Adam, who greatly influenced him. Maeterlinck established himself in Paris in 1896 but later lived at Saint-Wandrille, an old Norman abbey that he had restored. He was predominantly a writer of lyrical dramas, but his first work was a collection of poems entitled Serres chaudes [Ardent Talons]. It appeared in 1889, the same year in which his first play, La Princesse Maleine, received enthusiastic praise from Octave Mirbeau, the literary critic of Le Figaro, and made him famous overnight. Lack of action, fatalism, mysticism, and the constant presence of death characterize the works of Maeterlinck's early period, such as L'Intruse (1890) [The Intruder], Les Aveugles (1890) [The Blind], and the love dramas Pelléas et Mélisande (1892), Alladine et Palomides (1894), and Aglavaine et Sélysette (1896). The shadow of death looms even larger in his later plays, Joyzelle (1903) and Marie Magdeleine (1909), Maeterlinck's version of a Paul Heyse play, while L'Oiseau bleu (1909) [The Blue Bird] is marked by a fairy-tale optimism. Le Bourgmestre de Stilemonde (1919) [The Burgomaster of Stilemonde] was written under the impact of the First World War. Maeterlinck developed his strongly mystical ideas in a number of prose works, among them Le Trésor des Humbles (1896) [The Treasure of the Humble], La Sagesse et la destinée (1898) [Wisdom and Destiny], and Le Temple enseveli (1902) [The Buried Temple]. His most popular work was perhaps La Vie des abeilles (1900) [The Life of the Bee], which was followed by L'Intelligence des Fleurs (1907) [The Intelligence of the Flowers], studies of termites (1927), and of ants (1930). In later life, Maeterlinck became known chiefly for his philosophical essays. In 1932 he was given the title of Count of Belgium. Maeterlinck later tainted his career with an act of academic plagiarism which can be read about on Wikipedia. His play of Ardiane and Barbe Bleue or, The Useless Deliverance is fascinating and definitely anticipates the 20th century trends and sensibilities. You can read a synopsis of the operatic adaptation (which changed almost nothing from Maeterlinck's original) at Wikipedia. It's hard to talk about the play without revealing its twisty ending, so SPOILERS here. Ardiane ends up trying to rescue the wives, who are not dead, only imprisoned, as well as Bluebeard. Ultimately, they refuse to be helped, to change their circumstances, to move forward. They stay behind with the wounded Bluebeard. Ardiane departs, free herself, but defeated in her efforts. Yes, there is all kinds of analysis and symbolism here--Maeterlinck is considered a pioneer of the Symbolist movement. It makes for a great paper and comparison to the other tales in Bluebeard's history. Before all things we must disobey. That is the primal duty, when an order comes with threats and is unexplained. The others were wrong, and if they were lost, it was because they hesitated. She is an indomitable and baffled spirit. Passing the jewels by, she goes straight to the forbidden door and penetrates to the hidden caverns beneath. There she finds all her sisters, all the dear, sad, loving women of the earlier plays, Selysette and Melisande, Ygraine and Bellangere and Alladine. She embraces them, and bids them take heart. Can you not laugh yet—laugh and clap your hands? And all the rest are silent! What is this? The high green gardens blowing overhead? Do you not know the world is in the Spring? Dew in the leaves, and laughter of the sea? She puts herself at their head, teaches them to break out of their dungeon, herself bursts the bars and lets the light, the divine light which they had falsely taken for a superincumbent ocean, flood in. She decks and adorns them, hangs the jewels upon them, frees them even from the constraint of their raiment, bares Selysette's arms and lets the marvel of Melisande's hair flow loose. Her passion and audacity master them for a while. They are on the point of leaving the castle, and then they fail her. The peasants, angered at Barbe Bleue's wickedness, have attacked him. He is brought in wounded, and the women cluster round with soft hearts and tears of pity. Ariane is herself the first to cut his bonds. But her purpose has not changed. Can they be brought to leave him? Down yonder, where I am awaited still. . . .
Do you come with me, Selysette? But when will you return? O see the open door, the far blue hills! Ygraine, are you not coming? We often accuse Hollywood of being uncreative and unimaginative, constantly recycling popular films with sequels or remakes. It's a valid accusation but not a new one. It's been a trend with those who produce theatre and entertainment (books included) for centuries. Bluebeard provides a great example of this. George Colman the Younger’s Blue-beard; or, Female Curiosity! A Dramatick Romance (1798) is often credited with popularizing the portrayal of Bluebeard as a Turk in future literature and illustrations. It didn’t create the trend but built upon the Turkish elements in a French production, Raoul Barbe Bleue (1789) by André Modeste Grétry and Paul Sedaine as well as the growing popularity of the Arabian Nights during that era. Colman’s play served as inspiration to many burlesques and operettas that followed in the 1800s, a few of which are included here. There were many reasons for giving the production a Turkish setting--too many to discuss here or in my introduction--but it proved an unforgettable choice. The play was a smash hit and cemented the perception of Bluebeard as a Turk--turban, scimitar, and all. I'm oversimplifying the play's influences for the sake of brevity, but there were countless productions of Colman's play--musical actually--as well as remakes and rewrites and spoofs and references throughout the 19th century. Just as Disney influences what we see today about the fairy tales it has produced, Colman's Bluebeard influenced several generations and their perception of Bluebeard to the point where Perrault's popular tale was not as well known as this play by the less literate. There was clever writing and fun songs and a thrilling story. To read more about the work as well as what it influenced, I highly recommend Bluebeard: A Reader's Guide to the English Tradition by Casie E. Hermansson. (It's about much more than that, so I recommend it all around.) And of course, I included the full text of several of the plays in Bluebeard Tales From Around the World. You can hear piano only renditions of the music from the play at Romantic-Era Songs and even over two centuries later one can understand how this musical caught the public's attention. Never underestimate the power of some catchy tunes. The score was by Michael Kelly. Kiss, forgive, weep, and fall on the neck of his wife. When he falls on her neck, ’tis to cut off her head. Cuts the woman as well as the argument short. That the hair grows again but the head never will. Who can view, then demolish, a woman’s sweet face! And the devil take him who would offer her harm! Words you would not hear. Mr. E. Spencer Miller is a son of the late eminent theologian, the Reverend Samuel Miller, D.D., of Princeton, New Jersey, where he was born on the third day of September, 1817. When nineteen years of age he was graduated at Nassau Hall, in his native town, and having studied the law, and been admitted to the bar, in Philadelphia, chose that city for his residence, and has attained to a distinguished position there in his profession. Mr. Miller has not hitherto been known to the public as a poet. The only book upon the title page of which he has placed his name, is a stout octavo called “A Treatise on the Law of Partition, by Writ, in Pennsylvania,” published in 1847; but while engaged in researches concerning this most unpoetical subject, in leisure hours his mind was teeming with those beautiful productions which were given to the world in 1849, in a modest anonymous volume entitled “Caprices.” Among these poems are some that evince an imagination of unusual sensibility and activity, and in all are displayed culture and wise reflection. No one of our poets has made a first appearance in a book of greater promise, and it will be justly regretted if devotion to the law or to any other pursuit prevents its accomplished author from keeping that promise to the lovers of literature. [Miller, E. Spencer]. Caprices. New York: Robert Carter & Brothers, 1849. Griswold, Rufus Wilmot, editor. The Poets and Poetry of America. 16th edition. Philadelphia: Parry and McMillan, 1855. And, yes, this is in Bluebeard Tales From Around the World. Due to space constraints and scope, I didn't include much discussion in Bluebeard Tales From Around the World about the search for historical figures that may have inspired Bluebeard. Folklore scholarship in the nineteenth century was rather obsessed with finding the original source story of fairy tales and Bluebeard with his murderous ways provided great sport. The most popular--and least similar ironically--choice is that of Giles de Raiz who has had several books written about him, naming him the original Bluebeard. Some of those books include Bluebeard discussions, too. That portrayal of Giles de Raiz is debunked these days, but he is a fascinating, gory character if you are looking for a historical evil serial killer. The reality is that wife-killers are an unfortunate truth of history and any of them could be called Bluebeards of sorts and have been. There isn't any one source of inspiration in history for Bluebeard tales. However, the historical significance of some killers is fascinating, so I included the following article in the book and offer it in its entirety here. “LA BARBE Bleue” is in the “Contes” of Charles Perrault (1697). Dr. C. Taylor thinks the hero is intended for a type of the castle lords in the days of knight-errantry. Others think that Henry VIII, so often called the “royal Bluebeard,” was the original. But according to Holinshed the original of the nursery hero was Giles or Gilles de Retz (or de Raiz), Marquis de Laval, who lived at Machecoul in Brittany in the reigns of Charles VI and Charles VII of France and Henry VI of England. He was made marshal of France in 1429, distinguished himself by his military genius and courage against the English when they invaded France, and was possessed of princely revenues. Mézeray says he was impious and debauched, maintained sorcerers to discover hidden treasures, enticed the youth of both sexes to his house, then killed them to obtain their blood for his magical charms, and murdered six of his seven wives. For some state crime against the Duke of Brittany, he was strangled and burnt, or, as some say, burnt alive, in a field at Nantes in 1440. But the crimes of the Sieur de Laval do not resemble those of Bluebeard as nearly as do the crimes of Count Conomor, lieutenant of Brittany in the reign of Childebert. This man was a widower for the fourth or seventh time when he wooed Triphyna, the handsome daughter of Count Guereck of Vannes, who had been educated under the eye of St. Gildas, Abbot of Rhuys. Both father and daughter wished to decline the match, for Conomor was accustomed to murder his wives as soon as they gave evidence of pregnancy; but Conomor had powerful friends, and threatened vengeance if they refused: so, with the help of St. Gildas, an agreement was made that when Conomor tired of his wife he should send her back to her father. The wedding was celebrated at Vannes with great pomp, and Conomor took his bride home to his castle. When the countess became pregnant she observed a change in her husband’s manner, and, fearing the fate of her predecessors, fled on a swift horse with a few faithful followers to Vannes. Conomor pursued and gained upon her. She sprang off her horse and concealed herself in a forest, where Conomor found her and cut off her head with one blow. St. Gildas, hearing of this, hastened to the spot, and, putting the head on the body, by prayer restored her to life. When her son was born he was named Gildas, to which Trech-meur or Tremeur was added to distinguish him from the abbot. The legend is told by the Breton hagiologists Père Albert le Grand and Dom Gui-Alexis Lobineau. The events are said to have taken place in the sixth century. Hippolyte Violeau, in his “Pèlerinages de Bretagne,” says that in January, 1860, during the repairs of the vault in the chapel of St. Nicholas de Bienzy, some ancient frescos were discovered representing scenes in the life of St. Triphyna: 1, the marriage; 2, the husband taking leave of his wife and intrusting her with a key; 3, a room with an open door, through which are seen hanging the corpses of seven women; 4, the husband threatening his wife, while another woman (“Sister Anne”) looks out of a window above; 5, the wife with a halter round her neck, and the husband ready to put her to death, but interrupted by the arrival of her friends and St. Gildas just in time to save the future saint. Violeau thinks that if the frescos are really of the early date assigned them they probably represent the popular form of the legend, with some additional incidents which the hagiologists did not think worthy of record, and that it was without doubt the foundation of Perrault’s tale. In the “Polychronicon” (54, 6, recto, A.d. 1449), Caxton, after relating the troubles in Flanders, the loss of the towns in France, Pont de l’Arche and Rouen, the arrest of the Duke of Suffolk, and the anger of the Commons on account of the deliverance of Anjou and Maine and the loss of Normandy, says, “And in especial for the deth of the good duke of gloucester, in soo moche that in some places men gadred togedere and made hem capytaynes, as blew herd and other, which were resysted and taken and had justyce and deyd, and thenne the sayd parlement adiourned to leycetre.” The name seems to have been a familiar nickname, like Jack Straw, Hob Miller, etc. The saga of Bluebeard, as Grimm calls it, is wide-spread, and appears in many and various forms. The German version differs slightly from Perrault’s: Sister Anne is wanting, and the heroine lays the key in nay, there being a popular belief that hay draws out blood. Three of the tales in the “Kinder- und Haus-Mährchen” of Jacob and Wilhelm Grimm, namely, “Fitcher’s Vogel,” “Marienkind,” and “Der Rauber Bräutigam,” resemble Bluebeard more or less closely. In “Fitcher’s Vogel” the hero is a sorcerer, and the story is the same, except that the wife, having saved her two sisters from death by starvation, to which the husband had doomed them, makes him carry them home in a sack which bethinks contains gold, and herself escapes by rolling in honey and feathers till she looks like a great bird and is unrecognizable. In their notes the brothers Grimm say that they obtained it from two tales current in Hesse, a third from Hanover varying somewhat. Similar stories are Prohle’s “Fledervogel,” a Finnish version from Erik Rudhek’s collection, and two from Iceland, also a popular ballad “Ulrich und Annchen” (“Wunderhorn”), stories by Rosmer in “Altdänischer Lieder,” by Meier (probably from the French, however), Herder in “Volkslieder,” and Gräter in “Idunna.” A Dutch version represents the husband as devouring the bodies of his wives; the heroine, having found a woman preparing the bodies of her predecessors for the table, escapes in a hay-wagon to a neighboring castle; here, after some time, the husband comes to dine, and his former wife, whom he does not recognize, tells after dinner the story of his crimes, and, though he tries, to escape, he is seized and put to death. There is also a Norwegian tale (Asbjörnsen) and a Swedish popular ballad (Geyer and Afzelius), but nothing in Italian. The indelible blood appears in a story in the “Gesta Romanorum,” where a mother murders her child; four drops of blood fall on her hand and cannot be removed; she has to wear gloves always in consequence. In “Marienkind” we find the root-idea of many doors which may be opened and one which may not, with punishment following disobedience; but here a religious element is introduced, and the heroine is a child protected by the Virgin, whose curiosity leads her to peep at the divine mysteries and her finger becomes coated with gold, not to be washed off, and betraying her. The ending of this tale is, however, quite different. The Grimms compare this with one by Meier, the Swedish “Graamantel,” one from the “Pentamerone” (where a goat’s face is the punishment), and others from the Norwegian, Wendish, and Wallachian. The legend of St. Ottilia resembles it (told by Frau Norbert in “VolksMährchen”). Grimm’s version is from Hesse. The story of the “Robber Bridegroom” differs in some respects. He is captain of a band of robbers who entice girls to their den, cut them in pieces, salt and eat them. One girl, who escapes this fate, invites the chief to her house for the wedding-feast, tells the story, and he is killed by her friends. This tale was from Lower Hesse; others similar to it are in Carol, Stahl, Meier, Prohle, and in the Danish and Norwegian. It closely resembles the narrative to be found in Boswell’s Life of Johnson (with Malone’s notes), and by, I believe, Blakeway. In this story, the hero, Mr. Fox, decoys girls to his house, and Lady Mary, one of his intended victims, having discovered skeletons, etc., in his house, escapes, and a few days later, when Fox dines with her family, she relates her adventures, and convicts Fox of his guilt, and her two brothers slay him. This is like the Dutch version of “Fitcher’s Vogel,” already spoken of. Finally we have the story of the third calender in the “Arabian Nights” (Night 66). The forty princesses wish to leave their palace for a few days; and give King Agib their keys: he is to enter all their rooms save one. His curiosity overcomes him, and he opens the door, and misfortunes follow in consequence. The same misadventure had befallen other princes, whose warnings he had disregarded. Among all these variations of the story from so many different sources, it would seem a difficult task to find the genuine “original” of Bluebeard.—One of a Thousand. “Who was the original Bluebeard?” Lippincott’s Monthly Magazine: A Popular Journal of General Literature, Science, and Politics. Volume 43 (Jan.-Jun. 1889). pp. 278-280. Fairy tales in the Americas are a strange breed. For the most part, they are either Native American or they are hybrids of European tales. For me, being Southern, the Southern spins on European tales are the most entertaining for they usually take on the most regional flavor that make them truly Southern. But today's tale isn't Southern. As I hunted for tales from North America to include in Bluebeard Tales From Around the World , I discovered Jean-Parle, an unabashed ATU 311 tale, from French-speaking Quebec. It was longish, but since French intimidates me the least, I jumped in and translated it. This one feels European and even uses a Eurpean setting, but it is somewhat different from any other version I discovered. Not to say that there isn't a French variant that may be almost identical, but I didn't find it. ONCE there was a widow who had three daughters, Charlotte, Javotte, and the youngest, Finette. They earned their living by spinning wool for their neighbors. One day, a well-dressed man arrived at their home and introduced himself by the name of Jean-Parle. “Madam, I seek a servant,” he said. If you know you ATU 311 by now, you can accurately guess that the two older sisters meet their deaths and Finette outwits Jean-Parle. The most unusual element, besides naming all the girls, is the recruiting of the girls as servants, not as wives. Jean-Parle also disguises himself in multiple disguises which isn't as common. Overall, the tale has a more literary feel with its detailing and descriptions although it was collected from a storyteller. Well, we haven't had an advertising post in a while so fortunately I noticed this one this week while zipping through a commercial break on my DVR. It's a salute to the Frog Prince although I think the message is a little confused. But perhaps that's just me? My favorite seconds are when the frog is obviously hoping to be transformed. I guess the message is that this water makes you appear like a princess to the point that a frog will hope you can transform him. ONCE there was a king who one day went out hunting. As he went along his way, he beheld a stag in the distance. He set out after the deer, chasing it on and on, until it leapt into a forest. The king also leapt in, and as he rushed to and fro, he at last came upon a garden. While in the garden, he lost sight of the stag and soon realized he didn’t know how to find his way out of the forest again. Because he saw no one in the garden, he opened a door that stood before him and stepped into another garden, this one filled with trees of gold and flora of diamonds. In the garden there was a lovely rose that he desired to cut. But when he did, a long rope came forth and wrapped itself so tightly around him that he could no longer move. Now, unhappy and unsure of what to do, he began to cry rather piteously. Then he heard a noise, a noise that made the earth tremble. Suddenly a giant dragon emerged from the dense undergrowth. The poor king promised so the dragon freed him from his fetters and showed him the way out of the forest. The dragon advised him not to forget to bring his daughter and the king went away, trembling. Did you read it? 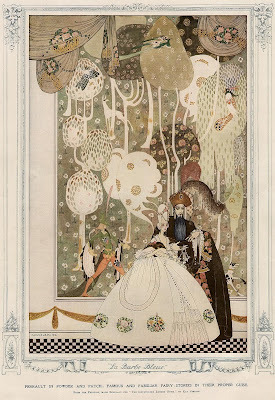 If you didn't know I was discussing Bluebeard ad nauseum this month, wouldn't you assume this was an entry about an unusual Beauty and the Beast tale? I thought it was when I started reading it. Part of me even hoped for it since a Beauty and the Beast collection is on the near horizon and it is one of my personal favorite tale types. But it isn't. It is a Bluebeard tale of sorts, closest to an ATU 312 Bluebeard, with the forbidden chamber and all. Except the chamber houses a very much alive prince and then the tale turns into a Black and White Bride variant. So, no, it is not a pure ATU 312 for the girl rescues herself and has to suffer more adventures until she is recognized as the proper bride of the prince she rescued, but it has enough elements to warrant its inclusion in this collection. Well, we really wouldn't want to leave one out would we? So here is a trailer and a clip from the upcoming ABC series called Once Upon a Time. After watching both this and the trailer for NBC's Grimm, I have to admit this one suits my fancies better. The concern is that this is higher concept and most likely higher budget so it will require a bigger audience to stay on the air. Not that I won't try out both. But this one also has more girl power in it. The other, if I remember well after one viewing, is male dominated with women only playing victims. Can't we have at least one strong female character? Please? Once Upon a Time might actually pass the Bechdel Test. Grimm doesn't look as promising on that front. From the inventive minds of "Lost" executive producers Adam Horowitz and Edward Kitsis comes a bold new imagining of the world, where fairy tales and the modern-day are about to collide. And they all lived happily ever after - or so everyone was led to believe. Emma Swan knows how to take care of herself. She's a 28-year-old bail bonds collector who's been on her own ever since she was abandoned as a baby. But when the son she gave up years ago finds her, everything starts to change. Henry is now 10 years old and in desperate need of Emma's help. He believes that Emma actually comes from an alternate world and is Snow White and Prince Charming's missing daughter. According to his book of fairytales, they sent her away to protect her from the Evil Queen's curse, which trapped the fairytale world forever, frozen in time, and brought them into our modern world. Of course Emma doesn't believe a word, but when she brings Henry back to Storybrooke, she finds herself drawn to this unusual boy and his strange New England town. Concerned for Henry, she decides to stay for a while, but she soon suspects that Storybrooke is more than it seems. It's a place where magic has been forgotten, but is still powerfully close... where fairytale characters are alive, even though they don't remember who they once were. The epic battle for the future of all worlds is beginning, but for good to win, Emma will have to accept her destiny and fight like hell. "Once Upon a Time" stars Ginnifer Goodwin ("Big Love") as Snow White/Sister Mary Margaret, Jennifer Morrison ("House MD") as Emma Swan, Robert Carlyle ("The Full Monty," "Trainspotting," "SGU Stargate Universe") as Rumplestiltskin/Mr. Gold, Lana Parrilla as Evil Queen/Regina, Jamie Dornan as Sheriff Graham, Jared Gilmore ("Mad Men") as Henry, Josh Dallas as Prince Charming/John Doe and Raphael Sbarge as Jiminy Cricket/Archie. "Once Upon a Time" was written by Edward Kitsis and Adam Horowitz, who are also executive producers, along with Steve Pearlman (ABC's "V"). The pilot is directed and executive-produced by Mark Mylod ("Entourage"). "Once Upon a Time" is from ABC Studios. Well, here it is. Prepare to jump. The trailer for the new series, Grimm, that's the one picked up by NBC from the Buffy and Angel producers. What do you think? "The Trimmatos; or, The Ogre with Three Eyes" is a runner-up for most unusual Bluebeard story in Bluebeard Tales From Around the World . The tale is from Greece, and as you can guess from the title, the Bluebeard character is supernatural. That in itself is not that unusual. Many of the Bluebeard tales from Greece and Italy offer supernatural Bluebeard characters. In general, when you move further north in Europe, the Bluebeards begin to be real men, not magical creatures, although they may own magical objects such as the key, the egg, etc. I translated this tale from Recueil de Contes Populaires Grecs by Emile Legrand in my desire to offer more unusual Bluebeards not usually found in English language collections. HERE is the beginning of the tale and good evening to the company. There once was an old woodcutter who had three daughters. He also had three beasts of burden with which he transported the wood to raise his children. However, Madam, he could not raise them comfortably and he was distressed that he had nothing with which to buy a little something for his daughters. One day, however, he managed to acquire a scarf. The daughters were filled with joy upon seeing the scarf and the oldest wanted to use it to make herself a headdress. One day when she was wearing the headdress, she sat by the window for they had a small entresol whose window looked out onto the street. Now, Madam, there passed by a merchant who saw her and who she liked very much. Finally, Madam, he asked the neighbors if she was single or married. “She is single,” they told him. Therefore, Madam, the girl’s parents declared themselves satisfied and they gave her to him to wife. When the girl was with her husband, to show his pleasure in her, he gave her a hundred and one keys and said, “With a hundred of these keys you have the power to open. But this hundred and first key will not work because the room is empty.” After a long pause he said, “Instead of keeping this unnecessary key, give it to me.” Then he reclaimed it. Her curiosity eventually overwhelms her so she takes the key and opens the room. This is very abbreviated but from a window in the room she watches her husband take on his true shape and eat a corpse--not one that he has killed to the best of our knowledge, just one freshly buried. She is sickened by the sight and takes to her bed in misery and fear. He suspects her snooping and tests her by taking on the shape of her family members to see if she will reveal his secret. She keeps mum until he finally takes on the form of her beloved nurse. She reveals his secret then and he vows to kill her. She runs away and begs for help from people on the street, eventually ending up at a king's castle. Eventually she marries the prince and is delivered from her horrible, bloody husband. It is a great story and quite entertaining, three eyed ogre and all. The heroine is spunkier than many in the ATU 312 tales and is primarily responsible for her own rescue, so this one is more appealing to modern sensibilities, too.